Prevent destructive fading and discoloration of photos, even on walls in direct sunlight, with new premium archival technology. Trusted by top art museums, this frame has special UV blocking glass and mountboard made of material that actively draws harmful gasses and pollutants out. Black archival matting. Wall display only. Horizontal or vertical. Measures 13 1/2" x 16 1/2". Specify frame opening size: 5 x 7 frame, 8 x 10 frame or 11 x 14 frame. I wanted the UV protection for a photo to be hung on a stairwell wall near a skylight, and it was on sale. I like the glass used in this frame. 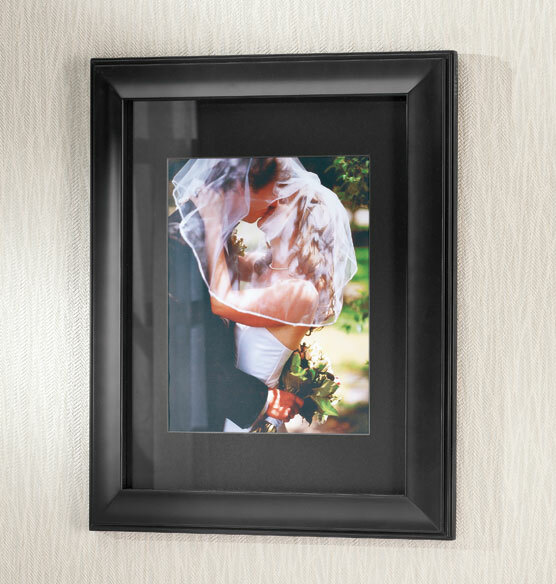 Beautiful frame that will protect my wedding picture.